The Department of Defense is gearing up to establish a sixth branch of armed forces by 2020 that will be known as the U.S. Department of the Space Force. Vice President Mike Pence revealed a set of potential logos for the new military branch on Thursday. Speaking from the Pentagon, Pence announced plants to establish the U.S. Space Command, Space Operations Force, and a new join organization called the Space Development Agency. 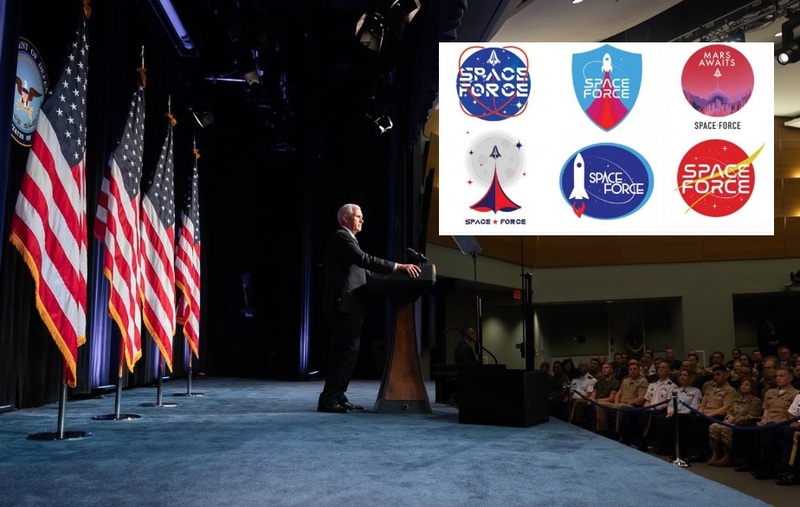 The logo reveals followed a seven-week review by the Department of Defense at the behest of President Trump to determine "the process necessary to establish a space force as the sixth branch of the armed forces." The results of the study are set to be released sometime today. "In his inaugural address to the nation, President Trump declared that the United States stands ‘at the birth of a new millennium, ready to unlock the mysteries of space,'" Pence said. "The time has come to establish the United States Space Force," he continued. "To be clear: the Space Force will not be built from scratch, because the men and women who run and protect our nation’s space programs today are already the best in the world. Across this department and our intelligence agencies, there are tens of thousands of military personnel, civilians and contractors operating and supporting our space systems — and together, they are the eyes and ears of America’s warfighters around the globe." "For many years, nations from Russia and China to North Korea and Iran have pursued weapons to jam, blind and disable our navigation and communications satellites via electronic attacks from the ground," the Vice President said. "But recently, our adversaries have been working to bring new weapons of war into space itself." Pence referred to a 2007 missile test by China where it tracked destroyed one of its satellites. He also spoke of how Russia is working on an airborne laser to disrupt space-based systems. "Both nations are also investing heavily in what are known as hypersonic missiles designed to fly up to 5 miles per second at such low altitudes that they could potentially evade detection by our missile defense radars," he continued. "In fact, China claimed to have made its first successful test of a hypersonic vehicle just last week," he said. Pence also spoke of America's goal of peace but added that sometimes action is necessary. "But history proves that peace only comes through strength and in the realm of outer space, the United States Space Force will be that strength." Were so good at coming up with better ways to kill! Why don't all these damn countries use that money for the betterment of mankind instead of for it's destruction! The people of the world don't want war, only the elitist and war mongers who make money off of war want it. The people of the world need to tell their leaders, no more war or get replaced!